Located 17 million light years away in the constellation Draco (The Dragon) is this beautifully active galaxy cataloged as NGC 6503. Vast regions of orange (usually pink but unusual filters were used) star birth rip through the spiral arms and it appears that there is plenty of material in the form of gas, dust and molecular hydrogen to continue populating the galaxy for a long time even with the super massive black hole at its core. One thing that’s not so evident in this image is that it’s alone. It has no local group and no company to speak of for millions of light years. Just an individual island oasis on the edge of what’s known as the “Local Void.” The Local Void is a gravitationally induced, seemingly empty region of space that spans upwards of 150 million light years and is where few other luminous objects exist. WHAT IS IT? : Dwarf spiral galaxy. HOW BIG IS IT? : Roughly 30,000 light years in diameter. HOW FAR AWAY IS IT? : Roughly 17 million light years. APPARENT MAGNITUDE? : At mag 10 it’s within small to moderate sized telescope view. WHERE IS IT? (General): Northern constellation Draco (The Dragon). WHERE IS IT? (Exact RA/DEC J2000): RA 17h 49.4m 00s / DEC +70° 09′ 00″. 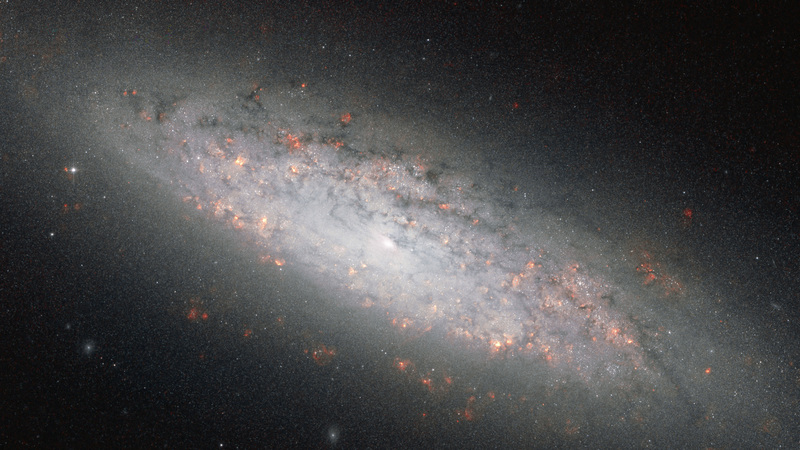 Image | This entry was posted in Astronomy (Learning), Astrophotography (DSOs), Galaxies, Images and tagged DanSpace77, ESA, Galaxy, Hubble, Local Void, NASA, NGC 6503, Science, Space, Space Telescope. Bookmark the permalink.